If you have a burning sensation in your chest while walking on a treadmill, you're likely experiencing symptoms of exercise-induced asthma. Exercise tends to trigger an attack for most chronic asthma sufferers, but in some cases, exercise is the only trigger. Consult with your doctor for a proper diagnosis and treatment. The symptoms of exercise-induced asthma will typically begin a few minutes after starting to walk at a continuous brisk-pace on a treadmill. In addition to a painful burning sensation in your chest, you may have chest tightness, coughing and wheezing. You may feel short of breath and fatigue which causes you to reduce the speed of the treadmill. While breathing in, the skin between your ribs will pull inward. 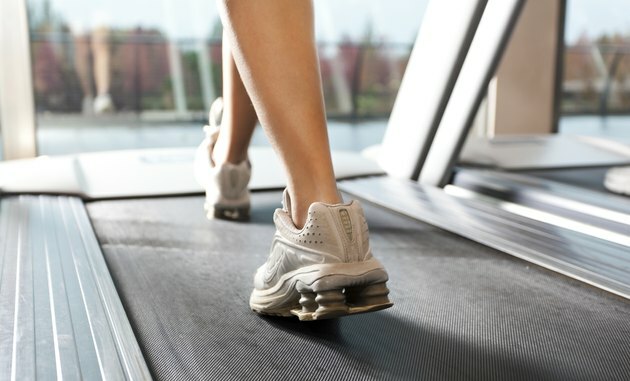 The burning in your lungs while walking on a treadmill is caused by the air passages that lead to your lungs swelling and creating excess mucus during physical exertion. Cold and dry air most commonly triggers the symptoms of exercise-Induced asthma. Some gyms turn their air conditioners to a low temperature setting during the summer because people get hot working out. The cold dry air of the air-conditioned room could lead to asthma symptoms while walking on a treadmill. If you have allergies, these symptoms can also be triggered or worsened by substances in the environment, such as dust and mold. Walking on a treadmill near an open window when pollen and air pollution is high can also trigger asthma symptoms. A respiratory infection can also trigger the symptoms of exercise-induced asthma. If you only have symptoms while walking on a treadmill, your doctor will likely give you a quick-relief inhaler that can be taken 15 minutes before exercise and will open your airways for four to six hours. Quick-relief inhalers can also open your airways during an asthma attack. A long-acting inhaler, such as inhaled corticosteroids can be taken 30 minutes before exercise and last up to 12 hours. Leukotriene modifiers last 24 hours and are taken daily to prevent shrinking of the airways. If you need quick relief inhalers more than twice per week, see your doctor about switching to a long-term treatment option. Always take your medications as prescribed. Perform a 10-minute warmup, such as a light walk on the treadmill, before increasing your speed to a faster pace. Breathe through your nose; the nose naturally warms, filters and moistens air entering the lungs. Since walking is causing asthma symptoms, consider a different exercise regimen. Swimming provides humid and warm air to breathe in during exercise, but the chemicals in the pool may aggravate your lungs if you have allergies. Ensure the treadmill and room you exercise in is clean and the windows in the room are closed if pollen or pollution is high.